Hundreds of bombers and fighter escorts were flying toward their objective that day, an attack on oil and gas refineries in Ludwigshafen, Germany. Judy suffered heavy flak damage to an engine while en-route to her mission objective, but managed to drop her payload of bombs on target. The damaged engine caused Judy to lose altitude and speed as the squadron began their flight back to base, making Judy easy prey for six ME-109 fighters. Staff Sergeant Cross (Tail Gunner) and Staff Sergeant Giersch (Top Turret Gunner) are each believed to have downed an enemy fighter just before Judy was critically hit by a flurry of ME-109 rockets. Lieutenant Camp (Pilot), was quick to give the command for everyone to bail out over what was then German occupied France, near the town of Ully St. George. A war memorial commemorating Judy and her crew was erected in the French town of Ully St. George near the crash site in 2007. 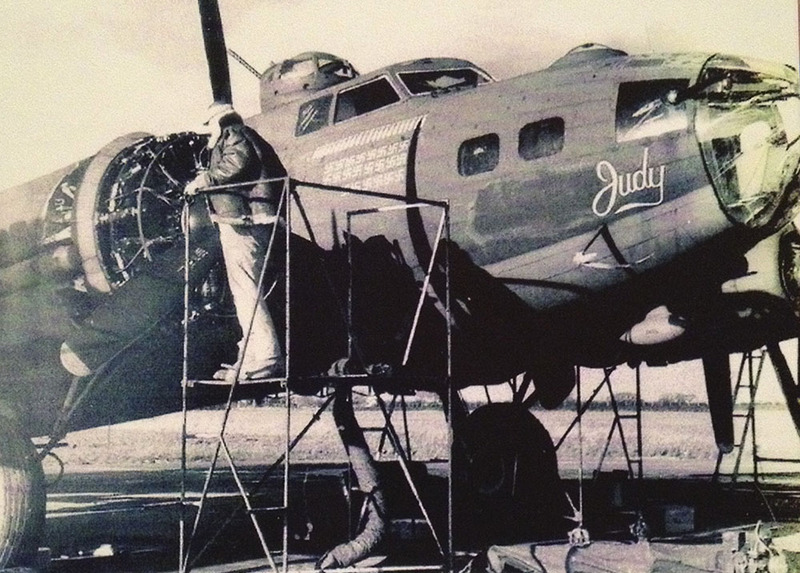 Photo reference of the original B-17 "Judy"